Documentation pertaining to the operation of hazardous production facilities. The certification body and testing laboratory of Special Industrial Examination, CJSC are registered in the Unified Register of the Customs Union and authorized to issue Conformity Certificate and record the declaration of conformity within the Customs Union. If your company has partnerships or trade relationships of the Customs Union, a Single Conformity Certificate issued by Special Industrial Examination, CJSC will provides customs registration of good and reduce the cost of certification alone in Russia, Belarus and Kazakhstan. 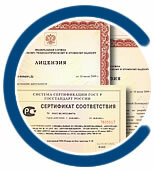 Certificates and declarations valid on the territory of the Customs Union drawn on a new form and entered into the Unified Register, in accordance with the decision of the Commission of the Customs Union. We provides an Expert Industrial Safety Review, offers (safety) certification, services in drawing up Permits for use of RosTekhNadzor.